As we all begin to count down the hours that remain of the year 2014, I have no doubt whatsoever that all of us in football will have our very own ‘New Year wish list’ as we get set to say goodbye to the old and welcome in the new in a few days time. To be perfectly honest, the past year has to be one of the best both at international and domestic level that I can remember for a very long time. Our international team recorded a remarkable three wins in succession at the start of the European Championships group qualifying series of matches, thus instilling a real feel good factor in the hearts and minds of our often tested, but remarkably loyal Northern Ireland supporters. In fact they just don’t come any better than our fans, do they? As the new year beckons we can only but hope that Michael O’Neill and his players continue to punch above their weight and do so as successfully as they have done in 2014. Also 2015 will see the completion of the newly refurbished international stadium at Windsor Park in Belfast. This extensive makeover and improvements have been long overdue. The old Windsor Park had become a total embarrassment so hopefully 2015 will see us proud once again to welcome foreign international teams back to Belfast. However it’s the real bread and butter issues at domestic level where I feel we have made tremendous strides forward in 2014. 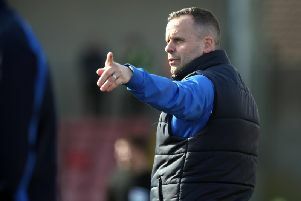 The formation of the Northern Ireland Football League (NIFL) has been a complete breath of fresh air and to be perfectly honest in many ways they have been the saviour of Irish League Football, which had been staring into the ‘abyss’ for quite some time. We all know that our game at local level had for years been allowed to degenerate into complete free-fall whilst certain people stood by either unable - or indeed unwilling - to arrest the slide. Some of them simply couldn’t see the wood for the trees. People who quite honestly appeared to think that football in this wee country of ours only centred around the international set up. While they became completely engulfed and bogged down with international football our local domestic game was unforgivably permitted to deteriorate into a very serious state of ill-repair. Thankfully 2014 saw the introduction of NIFL, and although they haven’t mended every single fault, they have at least refrained from using the proverbial ‘sticking plaster’ method to patch up what was a badly wounded product. No quite to the contrary, by carrying out a proper consultation process with the people who really matter in football, they have started from scratch by replacing our sport’s sandy foundations with a new solid base and infrastructure from which to work and as a result the fans have clearly bought into the entire concept. Attendance figures at games are well up and although there is still much to do in 2015 we must not forget that NIFL is barely half-way through its four year restructuring plan. So with that in mind I think both they and all the clubs deserve tremendous credit for what they have achieved so far. As for me personally, well yes I most certainly have some outstanding issues I’d like to see properly dealt with in 2015, matters which need to be addressed with definitive clarity and transparency, and the sooner the better I feel for us all - so here goes! Proper competent people in charge of all our major decision making committees and departments at the Irish Football Association. Lets not beat about the bush any longer, public confidence in some of our existing custodians at Windsor Avenue has long since evaporated, we need some new blood and soon. I’ve said it repeatedly that not all people you encounter who are bedecked in official blazers or club crested jackets are necessarily there for the good of the game, some may well be there for personal stature purposes and only to be recognised as ‘one of the boys’. Or perhaps for any association perks that may come with the job. These type of people bring absolutely nothing to the table of progress whatsoever and need to take a hike or be issued with a ‘one way’ ticket back to where they came from. They serve no purpose at all for the betterment of our game. Disciplinary code of conduct, rules and appeals committees also need major revision at the IFA in 2015. The most recent shambolic decision making with regard to these aforementioned issues were of totally unacceptable proportions. The standards shown were so poor that quite honestly I am surprised the people responsible for the shambles themselves weren’t charged with bringing the game into disrepute. These were all major decisions which affected lots of people and they should have been made correctly at the very outset with no room left whatsoever for misinterpretation of the law. Sadly what we got was more grey areas than Frank Mitchell’s weather chart on a winter’s day. I am also well aware that major investment by our local Government may be imminent and indeed is a distinct possibility in 2015 with regard to Irish League Football and in particular towards our games facilities. Whilst I welcome this long overdue news, even if it is only rumour at this stage, I do so with more than my fair share of trepidation. What I don’t want to see is a flurry of 3G and 4G artificial pitches being installed as the main playing surfaces at many of our Irish League grounds. By all means provide as many clubs as possible with plastic pitches for training purposes, but please retain as many proper grass pitches for the actual playing surfaces as possible. Just take a leaf out of Ballinamallard United’s book and install a proper sand-based ‘real’ grass pitch, or why not just ask a cross-section of our current Irish League players of their preferential choice. Something tells me that is where you will find your answer. We already have far too many ‘falsies’ in our football these days without adding more - we can and must correct this trend in 2015. The issue of ‘all ticket’ games at domestic level also needs proper revision in 2015. The health and safety guru’s or ‘UFOs’ as they sometimes get referred to, need to wind their necks in somewhat. Of course I don’t want to see fans or anyone’s health and safety compromised in any way, but more research must be carried out well in advance of any such fixtures. It is common knowledge that in many cases this ‘all ticket’ procedure can actually cost clubs valuable revenue with many of their seats empty and unsold simply because some fans cannot get time to purchase tickets in advance. More considered thought, particularly in practical terms, must be afforded to those unfairly deprived supporters, and please remember the best solutions are not always found around an office desk. For me this definitely needs a tweak in 2015. Next on the list is more television coverage for local football. Regular readers of this column will know this is nothing new for me to be saying as I’ve been pleading for it for years. Surely no harm done for asking again, is there? I genuinely feel that for what our sport has and does contribute to society in Northern Ireland the actual coverage we get is pretty poor to say the least. More people play football than any other sport in the country, but a question I am often asked is it perhaps because our game is seen by some as a working class sport? I sincerely hope not. I really think its time for the powers that be at local TV to give us a try, I more than think we deserve it. Finally, all that is left for me this year is to wish everyone a happy and healthy new year and thank you all for your continued support of this column - all being well I will see you all back at the far post again in 2015.